Plate 1. 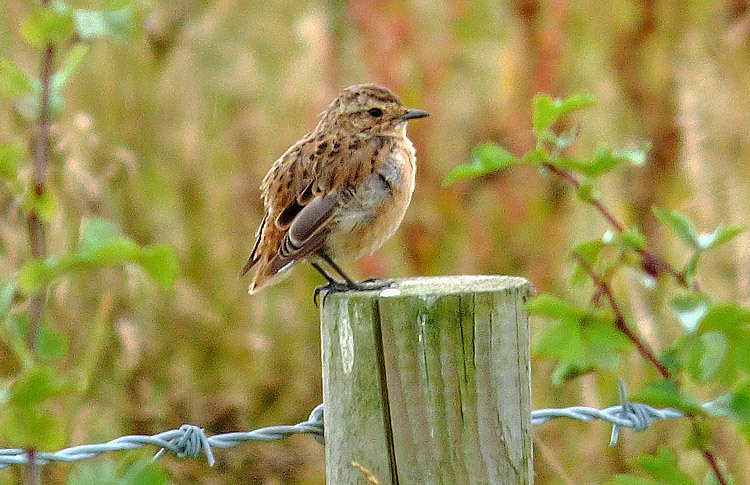 Whinchat, West Midlands, September 2016. Ginn, H.B. & Melville, D.S. 2000 (reprint). 'Moult in Birds'. Jenni, L. & Winkler, R. 2011 (reprint). 'Moult and Ageing of European Passerines'. Svensson, L. 1992 (4th edition). 'Identification Guide to European Passerines'. I would like also to thank Andy Warr for useful comments on an early draft of the text. 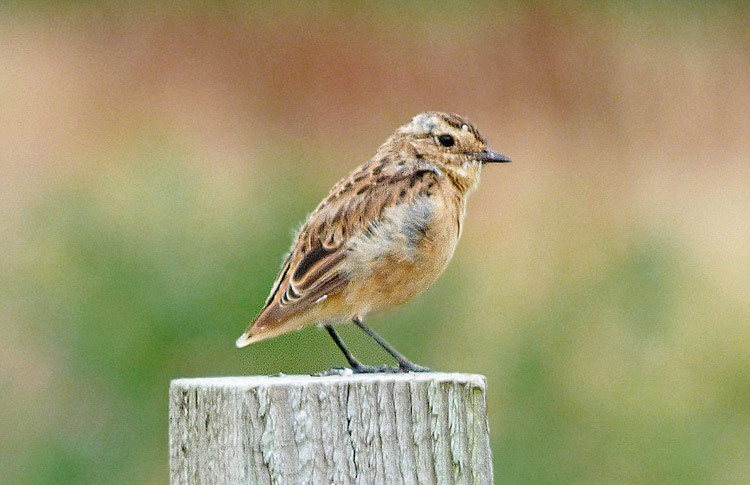 In most of the West Midlands region (comprising Staffordshire, Warwickshire, Worcestershire and the 'West Midlands' metropolitan area), the Whinchat is now exclusively a passage migrant, though breeding still occurs sporadically in N Staffs (most recently in 2014 and 2005, per Nick Pomiankowski  ). 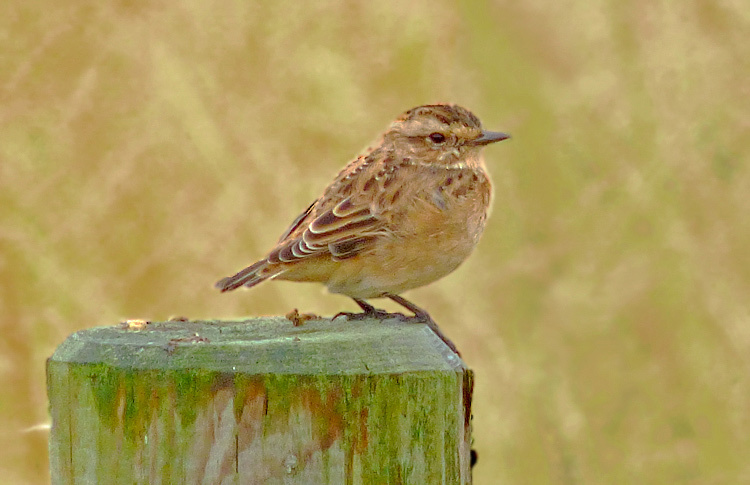 On July 22nd 2016, a pair of Whinchats appeared on passage at Castle Hills in the metropolitan 'West Midlands' and thus a considerable distance from the nearest regular breeding areas (in Wales and the southern Pennines). The male of the pair was present for only a single day but the female remained 'off passage' for over seven weeks, during which it underwent its complete post-breeding moult. 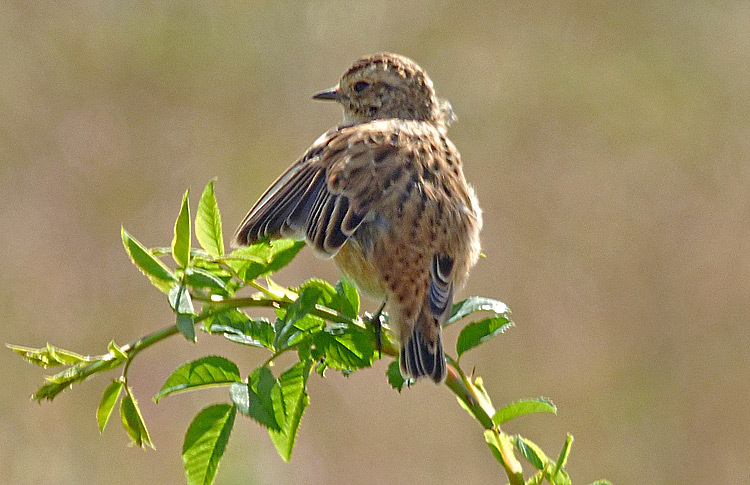 Typically, Whinchats moult during mid-July to late August, on or near the breeding grounds and before migrating. 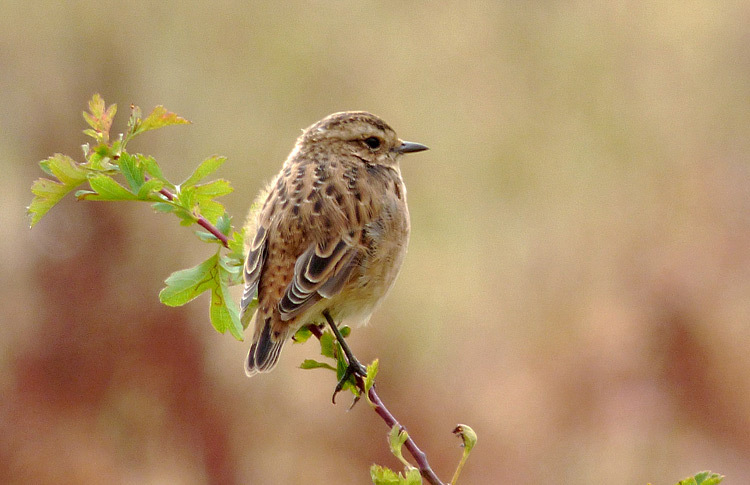 Adult Whinchats (and occasionally a juvenile or even a family party) may reach the West Midlands during the second half of July but this is infrequent and most birds do not occur in the region before mid-August, having already completed their moult. 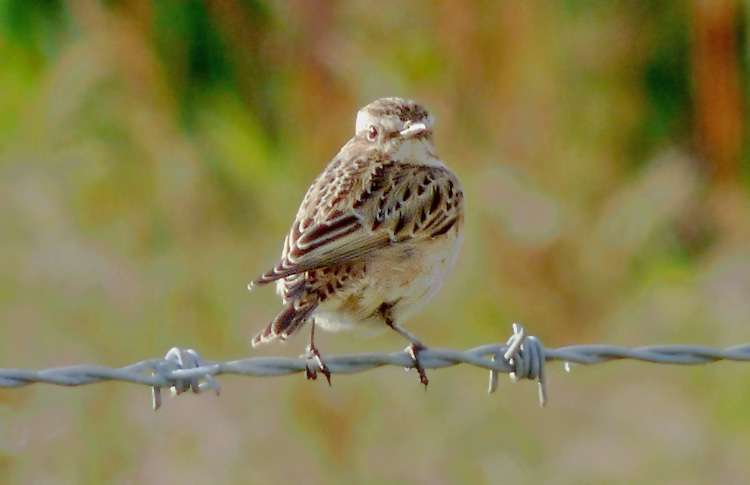 Perhaps failed breeders may be more inclined to leave the breeding grounds early, before moulting, and to moult further afield in the UK before undertaking their full departure to their wintering grounds in Africa. An individual lacking significant numbers of flight-feathers would be disinclined to migrate any significant distance and would, correspondingly, remain 'off passage' while those feathers were replaced. 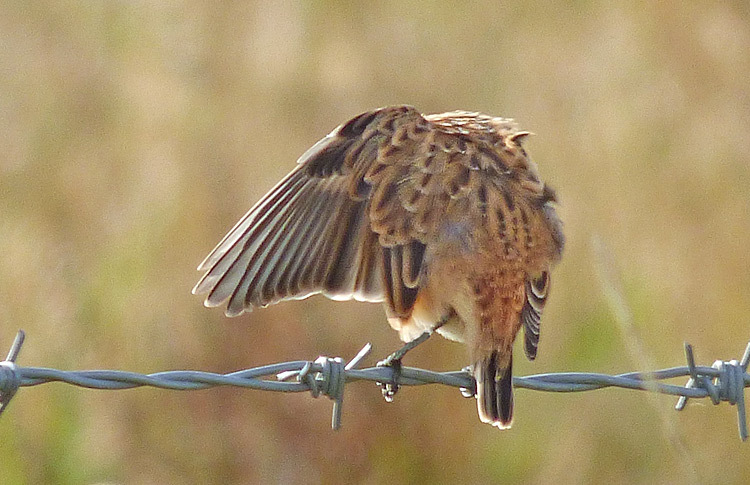 The individual at Castle Hills was notable also in that it dropped all its tail-feathers simultaneously and appeared 'tail-less' for over a week In most European species of passerine, the rectrices are moulted centrifugally, with more-central feathers well grown before the outermost are replaced . 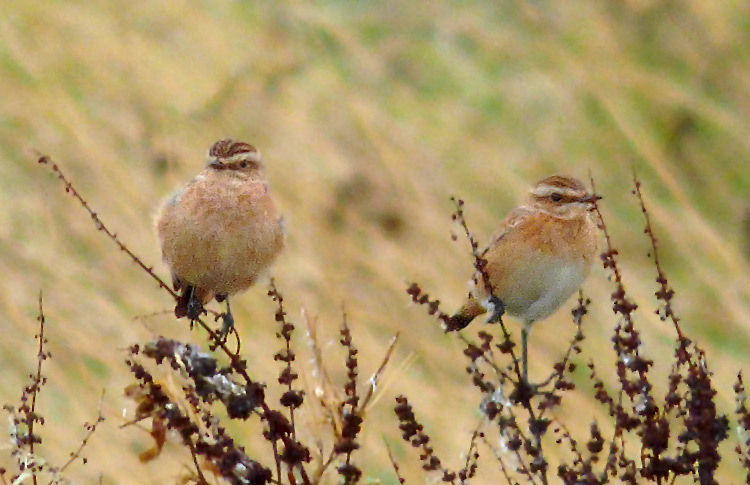 Simultaneous or irregular moult of the rectrices is more frequent (though not typical) in some species of passerine, including Wheatear (Jenni & Winkler), but it is unclear whether Whinchat falls into this category. Simultaneous loss of all tail-feathers may also be a result of accident or an encounter with a predator but, in this individual, its occurrence coincident with the start of the moult cycle suggests a natural event. 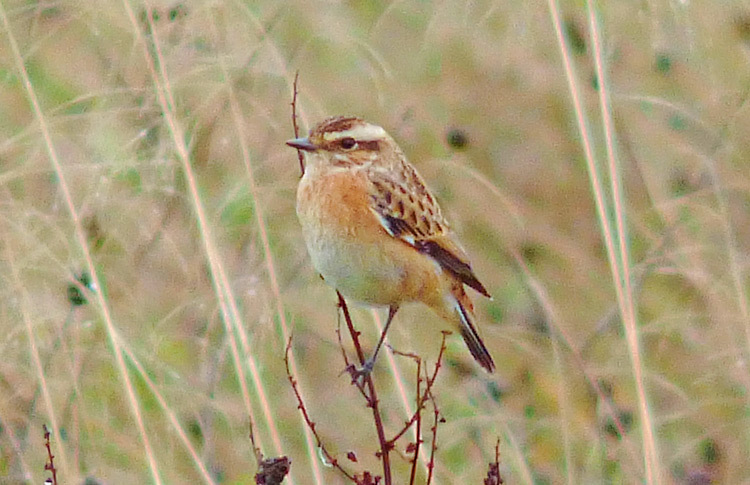 In most passerines, including Whinchat, primary moult is descendant (from innermost, near centre of wing, outwards towards edge of the wing). 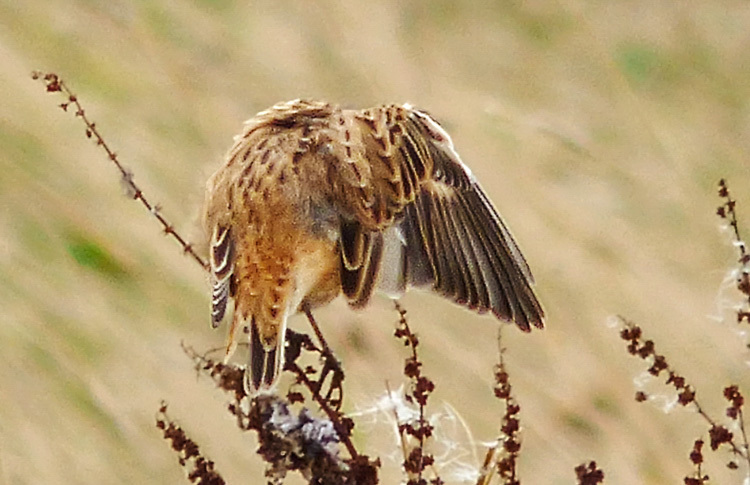 Secondary moult is ascendant (from outermost, near centre of wing, inwards towards body). The three tertials are normally moulted in the order: central, inner, outer. Moult of the tertials normally occurs shortly after the start of the primary moult while secondary moult normally commences when the primary moult has reached around p5 (see references listed above). Most moult studies involve aggregated data from multiple individuals, each of which is trapped and processed on just a single occasion. Conclusions are drawn from scatter diagrams and trend lines from the cumulative data (see Ginn & Melville). 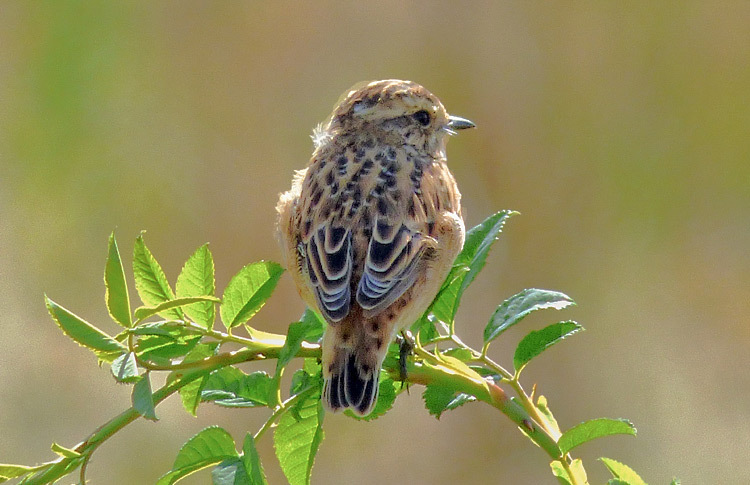 From such studies, the complete post-breeding moult in Whinchat is stated to take about 50 days. There are relatively few studies which have tracked a single individual through the course of its moult. 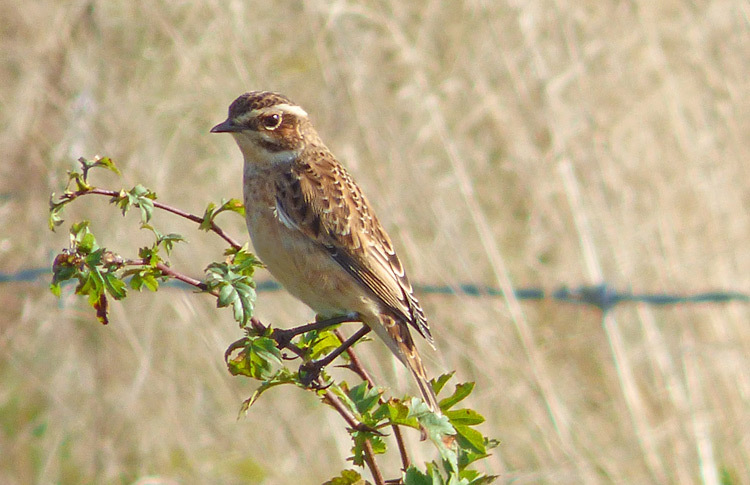 The photos below illustrate the appearance of the Whinchat at Castle Hills during the progress of its moult. They do not provide a formal or accurately quantified assessment of the moult but do illustrate the progress of a single individual, from predominantly old plumage through to completion of the primary moult. Primaries are here numbered ascendantly (i.e. outermost is p1 and innermost is p10), the scheme most often used in field studies of plumage and identification (e.g. Svensson 1992), though in moult studies conducted on trapped birds the reverse (descendant) order is traditionally employed. P1 is small (pc -2 / +3 mm) and rarely visible. In the captions below, the term 'outermost primaries' refers to the long outer primaries, p2 to p4. In calculating primary 'moult score', an old feather scores 0 while a new and fully grown feather scores 5. Feathers in pin and part-grown feathers score intermediate values (see Fig. 7b in Ginn and Melville). (Full grown feathers which briefly retain remnants of the waxy sheath at their base are scored 4 at that stage but this can be determined only in the hand.) Thus, prior to the primary moult, when all primaries are old, the moult score is 0. When all primaries have been replaced and are fully grown, the moult score is 50. By September 9th, after 50 days 'off passage', the moult score of the Castle Hills individual had indeed reached approximately 50, with all ten primaries replaced, p3 and p4 comprising the wing-point and the tip of p2 aligning between p5 and p6. 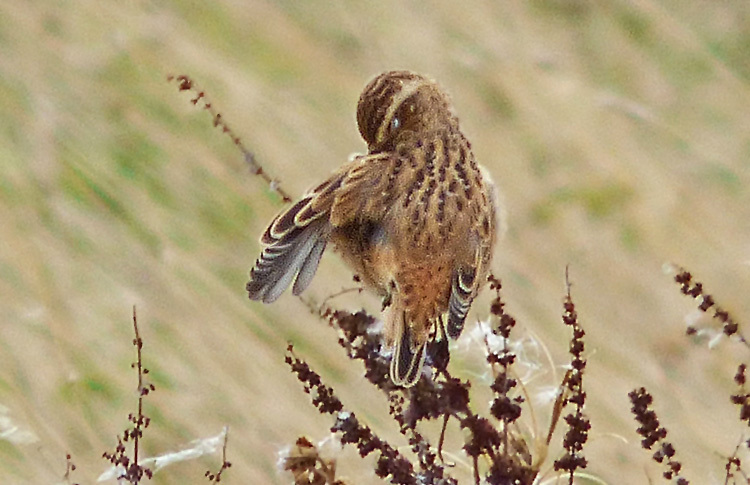 Secondary moult lagged behind, however, with two of the six true secondaries still to achieve their full length. but plumage clearly still predominantly old and faded and looking 'dishevelled'. Outer remiges and outer rectrices (at least) retained, with wings and tail correspondingly full length. 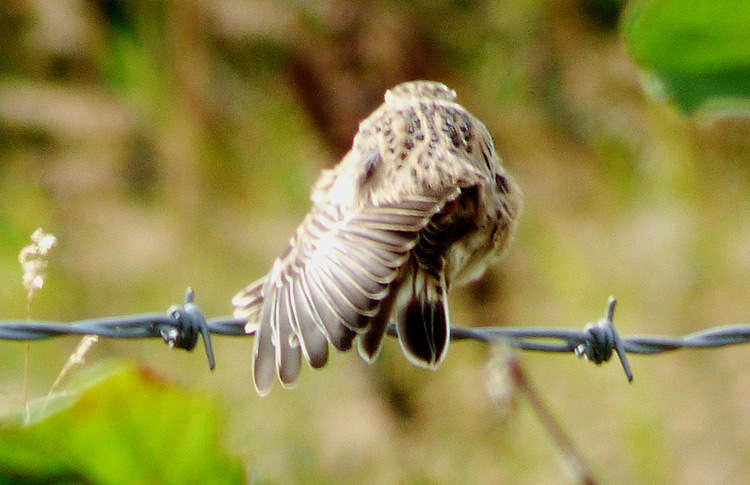 All tail feathers dropped and new feathers yet to emerge into view beyond upper-tail coverts. contrasting with the fresh, blackish and white-fringed tips of the newly acquired inner primaries. beyond the inner primaries. Primary moult score probably about 20. Still appearing 'tail-less'. Note also part grown and displaced tertials, with secondary visible below. Tail feathers now beginning to show beyond coverts. Four pairs visible and more-central three all growing at same rate. while the outermost (naturally the longest) is still small and very short, with much of underlying secondary still visible. Three fresh, white-tipped inner primaries (p9 to p7) are visible beyond secondaries and tertials. 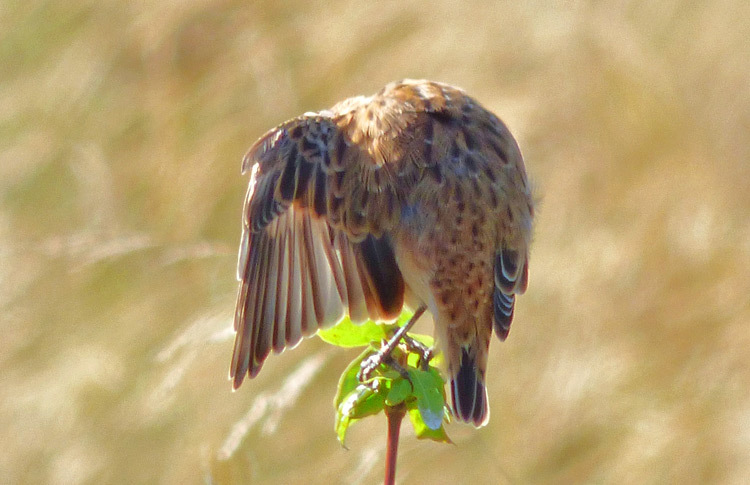 While preening, short (part grown) outer secondary and central primary visible. 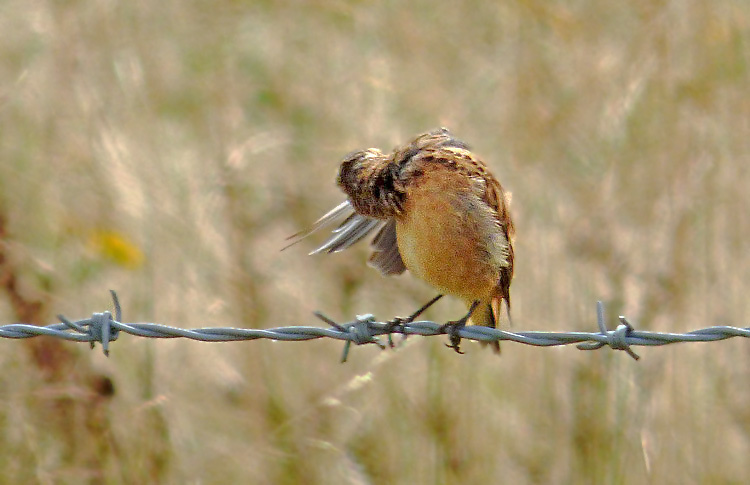 Secondary moult is in early stages while primary moult (which is descendant) has reached central feathers. leaving an obvious 'gap' in the sequence of primary tips (see plates 3 & 4). Part grown primary visible between renewed inner primaries and retained outer primaries. Tail-feathers have grown several millimetres in two days. Note also white here visible at base of outer rectrices. Old outermost primaries still retained. Further old outer primaries dropped at some time between August 12th & 15th but old p2 still retained. Tip of the newest visible primary is more widely spaced than inner three. With the naturally-longest primaries now dropped, spread wing appears short. Four pairs of tail-feathers visible and all growing 'synchronously'. Five fresh primary tips now visible beyond tertials (see enlarged detail below). the last remaining outer primary (p2) is visible below fresh primaries and extending backwards below displaced secondary. Final (long) outer primary p2 has been dropped since August 17th. The two more-distal and buff-fringed primary tips (p5 and p6) now well-spaced. New innermost tertial on left wing appears to have been lost ... but see plate 14. All six rectrices (but one displaced) are visible on right side of tail. Innermost tertial on left wing present. Appears smaller than that on right wing but this may be influenced by the placement of overlying scapulars. 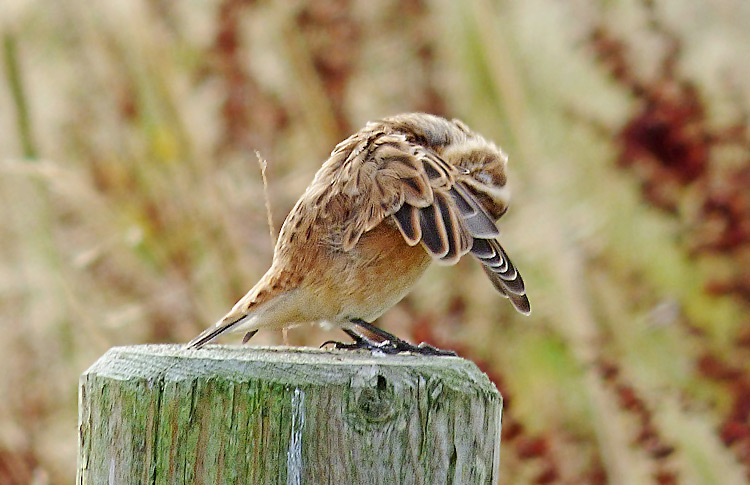 With wing partially extended during preening, p10 to p4 all visible. P10 to p7 are evenly spaced and have strongly contrasting white tips, while p6 and p5 are more widely spaced and with buffer fringe. P4 is as yet well short of its full length (when full-grown it will fall beyond the tip of p5). Innermost three secondaries, s4 to s6, still to be replaced. New outermost secondary s1 near full length while s2 about half-grown. With scapulars raised, greater secondary coverts here showing well and growing 'synchronously'. Wings and tail not yet full-grown but now approaching more-normal proportions. p9 extends fractionally beyond tertials. P10 to p7 are evenly spaced while p6 and p5 are more-widely spaced. Tips of part grown p3 and p4 visible at leading edge of wing. p2 extends about 50% towards wing-tip, p3 70% and p4 90% towards tip. When full-grown, p3 will be longest and define the tip of the wing. P4 will fall 0 to 1.5mm short of the tip, p5 will fall 1.5 to 4mm short of tip and p2 will fall 1.5 to 4.5mm short of the tip (BWP5). Thus, the primary moult score on August 26th can be assessed as about 40.
while p2 is about 15% short of full length (it will be 1.5 to 4.5 mm short of p3 when full grown). Moult score around 47. Several inner secondaries have yet to appear. With wing partly opened, tips of p5 and p3 fall just short of tip of p4, with tip of p2 currently aligning between tips of p7 and p8. When all primaries are fully grown, p3 will be marginally the longest while the tip of p2 will align between p4 and p6. On fully folded wing on left, tip of p4 just visible beyond p5. by overlying scapulars) and with rather warmer buff margins than the primaries. 1cy and 2cy variations). Four fresh secondaries are visible. with p5 a few mm shorter. The tip of p2 appears to align between p5 and p6. (see enlarged detail in plate 26b). In other postures, the pale tip of p3 merged with that of p4 or was hidden by it. Primary moult now effectively complete and moult score close to or equal to 50 (but secondary moult not yet concluded). In this enlargement, the tips of p3, p4 and p5 are visible, with the former two just discernibly separated. Note the continuing displacement of the outermost secondary. July 22nd to September 9th. Summary of moult progress of adult female. Plate 27. 22/07/2016 to 09/09/2016. 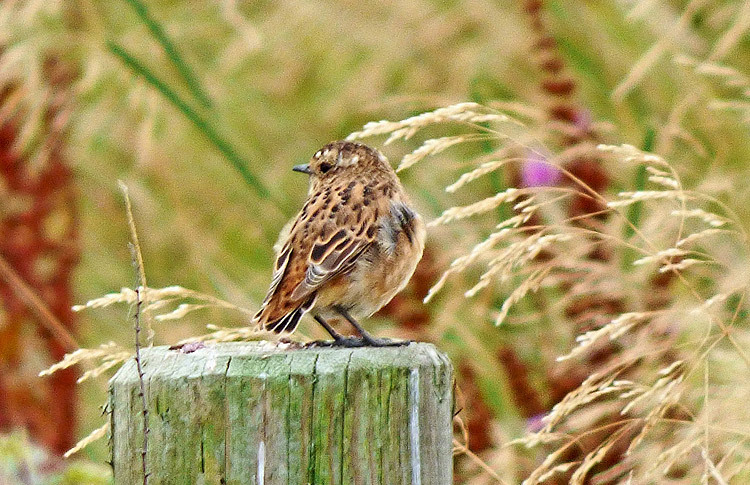 On day of arrival, July 22nd, plumage predominantly old and faded, including longest primaries and tail-feathers. By August 3rd all tail-feathers dropped and bird appeared 'tail-less'. Four inner primaries replaced, central primaries 'missing', while outer primaries old. By August 19th, significant tail growth achieved. All long outer primaries dropped, with fresh p5 and p6 temporarily comprising the wing-point. By September 9th, the tail substantially renewed and all ten primaries also new, with p3 and p4 comprising the wing-point and primary moult-score at or close to 50. Thus, post-breeding moult near to its conclusion but two innermost (true) secondaries still short of full length. 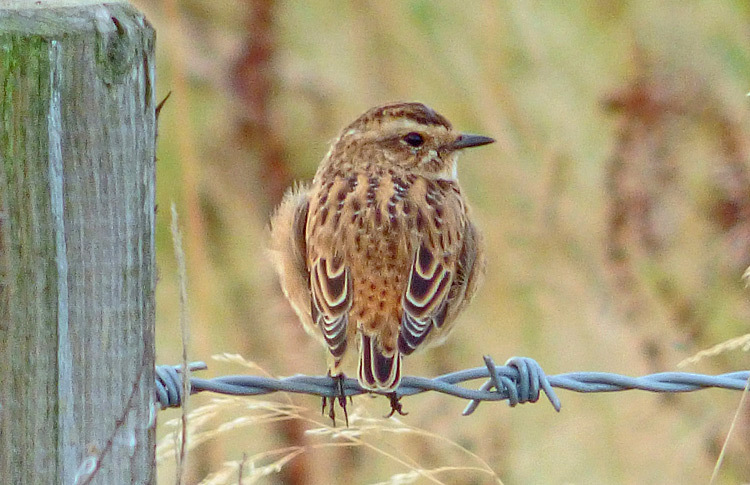 With all primaries in place, the Whinchat moved on within 48 hours. Appendix. 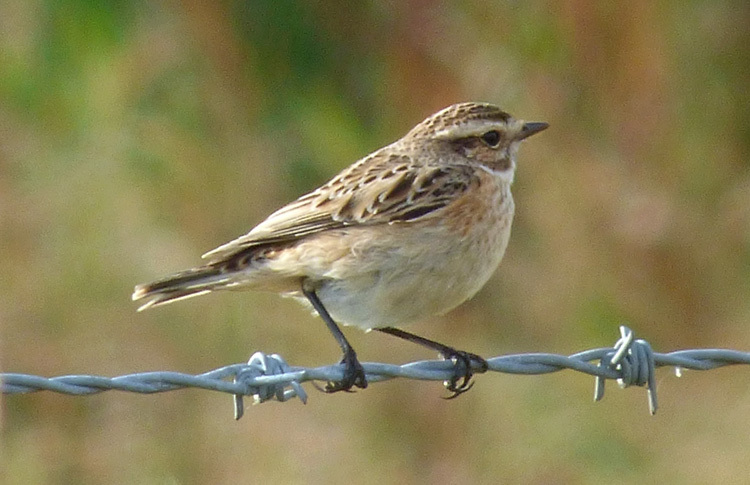 Comparisons with other Whinchats visiting the site. 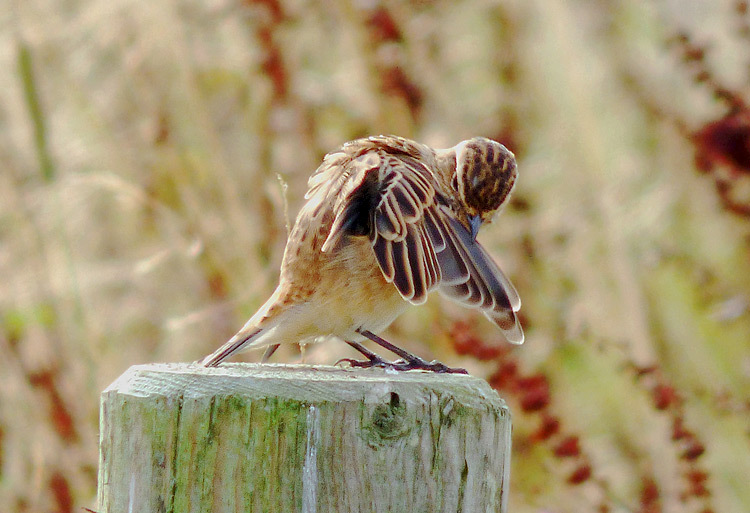 After the post-breeding moult and post-juvenile moult are concluded, adult and 1W Whinchats are described in the literature as rather similar and 'Collins Bird Guide' notes that they can be difficult to age in the field. The adult female at Castle Hills began its complete moult in late July and concluded the primary moult after about 50 days : both thoroughly typical. Thus, there seems no reason to suppose that its appearance in late-August and early September was other than typical. After completing its primary moult, the inner secondaries had still to achieve their full length (while body moult was probably not yet finalised). The innermost secondary was frequently 'misaligned' with respect to the primaries and its leading edge often extended beyond the leading edge of the folded wing as a whole. There was as yet no coherently-defined pale wing-panel and the 'upper' section of the folded wing retained a somewhat 'disordered' appearance, though this was arguably an individual foible. Also, the tail-feathers appeared still a little short. 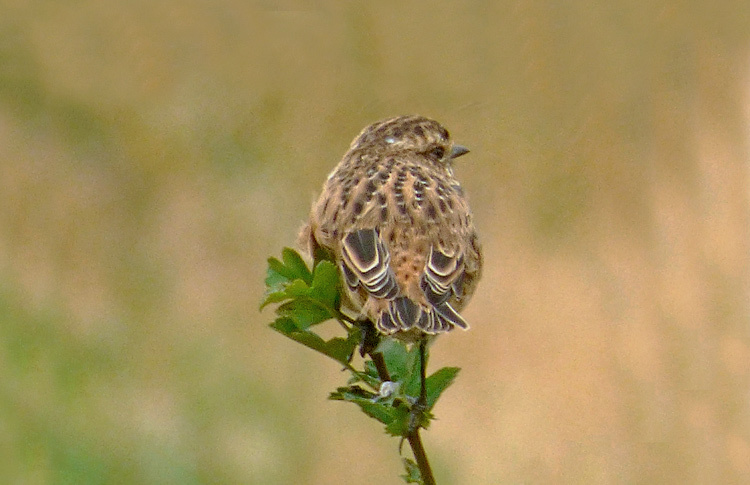 In contrast, three other Whinchats which arrived on August 29th displayed fully-grown and neatly-arranged remiges and full-length rectrices. Their folded wings displayed a well-ordered appearance and a prominent pale wing-panel, formed by well-aligned pale edges to the secondaries and tertials. All three moved on by September 7th but further individuals appeared on September 9th and September 14th, respectively. The latter was seen only distantly on that date but probably the same individual performed well on September 19th. Finally, two more appeared on October 3rd. These individuals too presented a very 'neat and tidy' appearance to their flight-feathers. 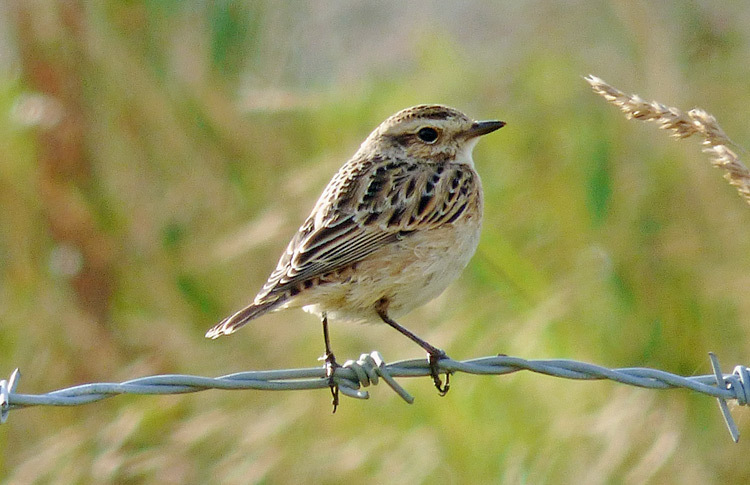 Certainly, an adult arriving in late August or early September could have commenced and concluded a complete moult even earlier than the female arriving on July 22nd (see scatter diagram for Whinchat moult in Ginn & Melville). However, it is perhaps more probable that the later arrivals were all first-winters, with well-established first-generation flight-feathers and having undertaken just a partial post-juvenile moult (involving primarily the body feathers and some inner gc). Despite the similarly pristine appearance of their flight-feathers, these later arrivals differed (from the adult female and among themselves) in the fundamental hues and distribution of their 'ground colours' and in certain other more-subtle features. The bird on September 19th seems safely attributable to a male, on the basis of crisply demarcated black-and-white outer tail-feathers and primary coverts. These issues are illustrated in the following plates. 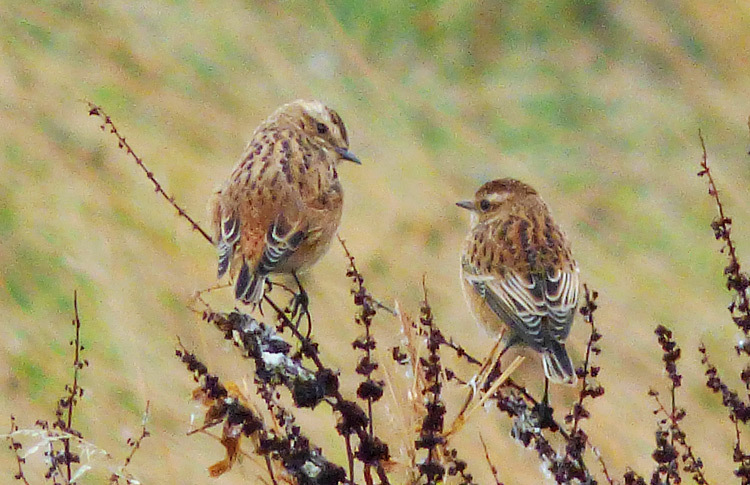 Peachy-buff suffusion on adult (on left) most intense on upper breast but encompassing entire breast and belly (under-tail area was paler). On individual on right, colour more saturated but restricted to upper breast and flanks (and forming a breast-band), with centre of lower breast and belly whiter. frequently overlapped the carpal area and the wing-coverts. The entire plumage of the right-hand bird has a more compact and 'leaner' appearance. It is difficult to correlate these features with published age-dependant characters and individual variation may also play a part. that the individual on the right is in first-winter plumage. On September 9th a 'new' arrival displayed an appearance which differed from any of the previous individuals. It displayed a colder and paler 'ground colour' to the upperparts, which imparted a more 'tawny' or even 'mealy' appearance and with enhanced contrast with the black feather centres. 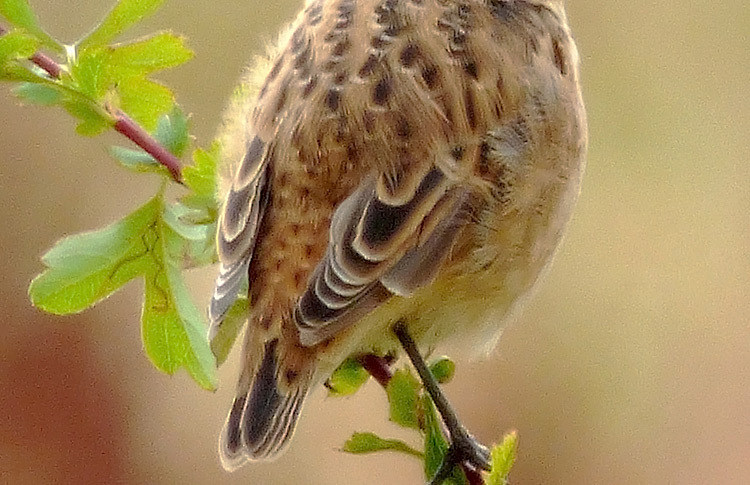 The outer upper-tail coverts were also relatively coarsely marked while the lower border of the ear-coverts was very prominent at times (this being somewhat dependant on posture). It disported a full set of remiges and a pale wing-panel. Although this was less prominent than that of the August 29th arrivals, pale edges to the primaries were of equal prominence to those on the secondaries, so the pale panel extended right across to the leading edge of the folded wing. On the August 29th arrival (photo'd on Sept 5th in plate 29), the fringes to the primaries were far more subdued than those on the secondaries, so the pale panel, while bolder, did not extend to the leading edge of the folded wing (see comparison in plate 34). 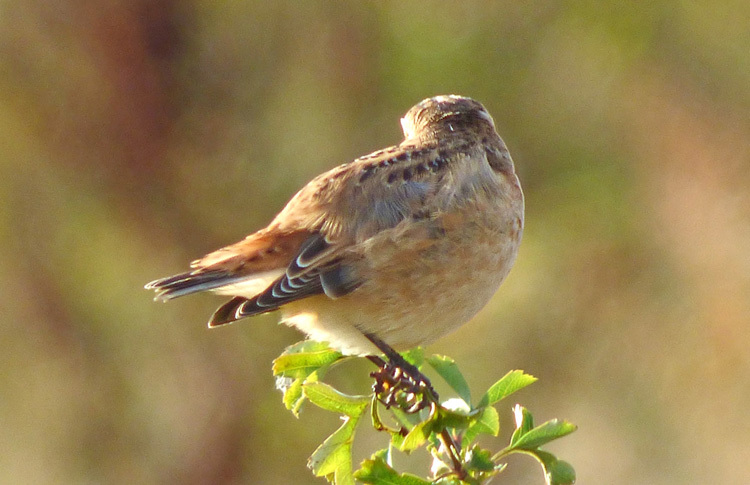 Although lacking the richer peach / orange hues of the earlier birds, there was a colour suffusion on the underparts of the Sept. 9th arrival, concentrated at the sides of the breast. Despite the relatively 'pallid' appearance, the head pattern and breast patches in combination could 'ghost' the appearance of adult breeding plumage. The boundary between the black and white on the outer tail-feathers was rather diffuse, a feature generally associated with females (Svensson 1992). arrivals, but extends across primaries to reach the leading edge of the wing. All feather edges 'cold creamy-buff', lacking the 'warm, rich buff' fringes displayed by all the earlier individuals. 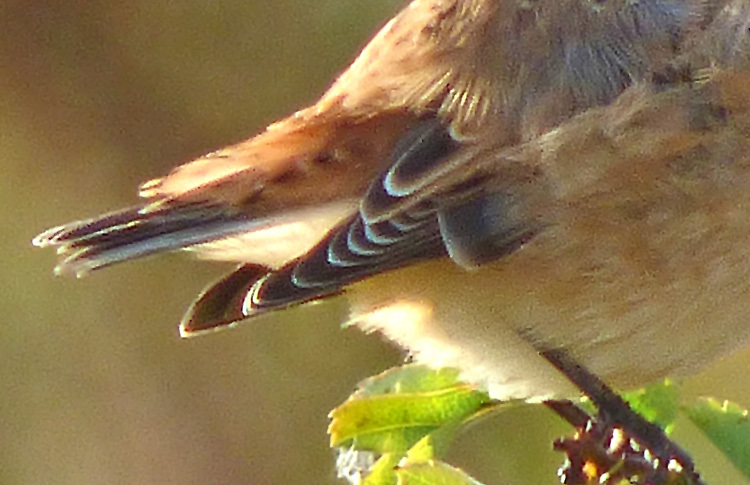 Note also the very coarse centres to outer upper-tail coverts. Inner gc covered by scapulars and no 'wing-bar' evident. In certain postures, a very prominent dark lower border to the ear-coverts was evident. 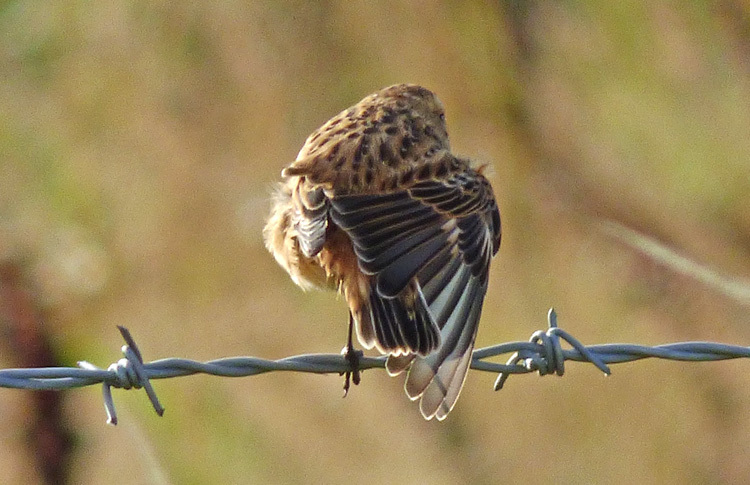 Together with peach / orange patches at the sides of the breast, there was at times a 'ghosting' of breeding plumage. All remiges fresh and in good order. Note diffuse boundary between black and white on tail-feathers. 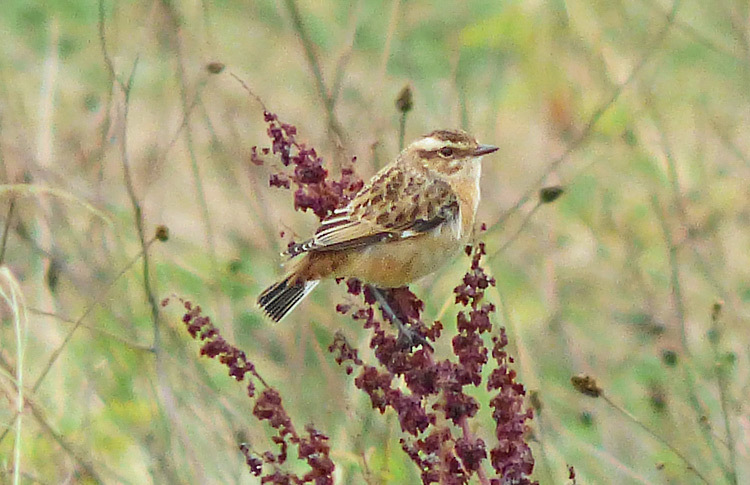 On September 19th, what was at least the eighth Whinchat to visit the site performed well. It was perhaps the individual observed only at long range on September 14th. As with the late-August trio, orange / peach on the underparts was concentrated on the upper breast and flanks, with the lower breast and belly whiter. The wing-panel was prominent (with paler fringes dominating darker areas) but was confined to the secondaries. The leading primaries on the folded wing appeared rather 'solidly' black. Unlike any of the earlier birds, this individual displayed a clear white patch at the base of the primary coverts and a sharp divide between black and white on the outer tail-feathers. These features indicate that it was a male. on the folded wing. Outer primaries appearing densely 'black', with pale edges to the secondaries creating a pale 'wedge' to the rear. 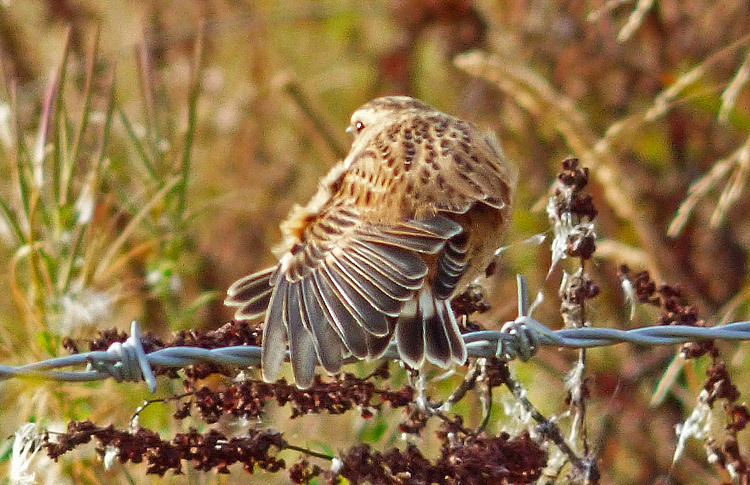 tail-feathers but they do appear 'spiky', perhaps again favouring ageing this individual as 1W. On October 3rd, the final two arrivals of the season appeared. 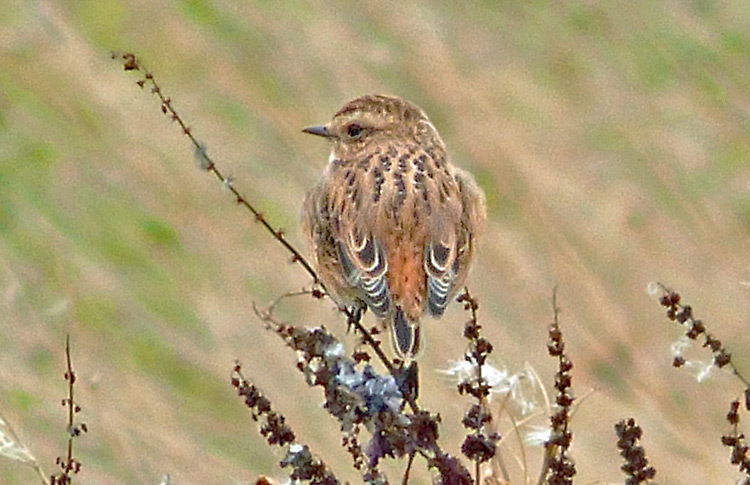 They remained several days, often in the company of a Stonechat. They most closely resembled the individuals which arrived on August 29th but with a somewhat more extensive wing-panel and lacking a visible wing-bar on the greater coverts (which were sometimes revealed and at other times hidden by the scapulars, depending on posture). 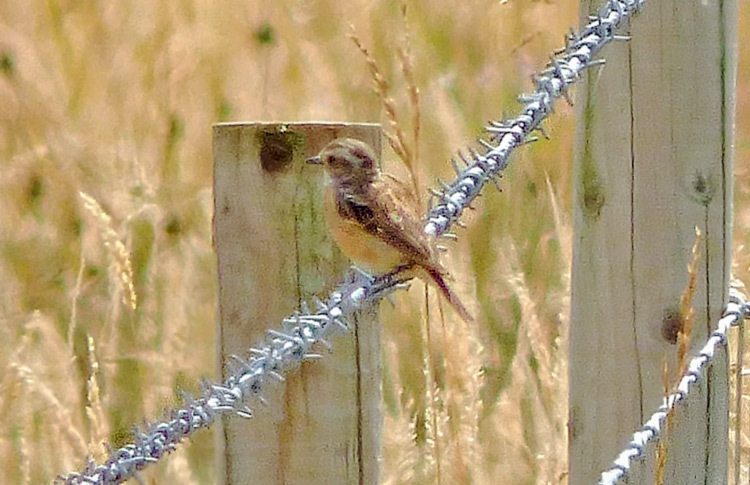 One individual was characterised by the prominence and extent of dark speckles on the breast, much better-defined than on any of the earlier birds. 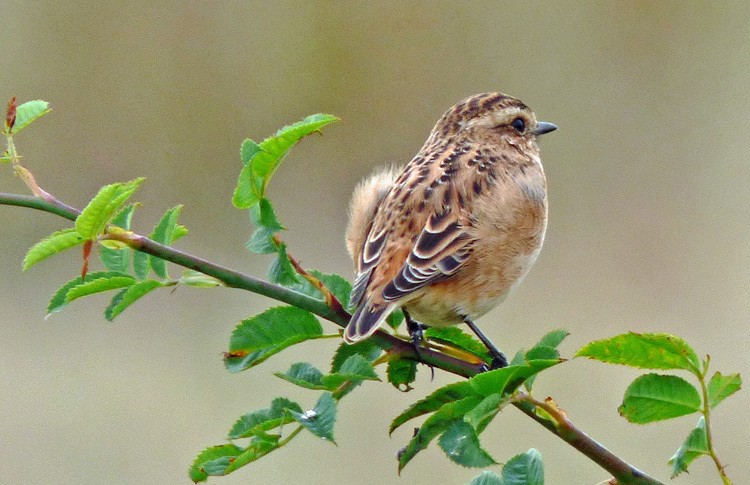 While 'both adults and young can have finely spotted breast' (Collins Bird Guide), the coarseness and prominence of breast markings on this individual once again suggest first-winter. Below are two images taken on October 5th. with a correspondingly more-conspicuous eye-ring, but light conditions (very bright from side) may well be influencing this effect. speckles or blotches, which again suggests a 1W individual. and other differences in the patterns of the folded wing. Also, the pattern of the outer tail-feathers of the fourth individual is visible. On right-hand individual note the relatively coarsely-marked breast (it otherwise most-closely resembled bird 2). but care in interpretation is required, as other photos show how such features are affected by posture . 1. 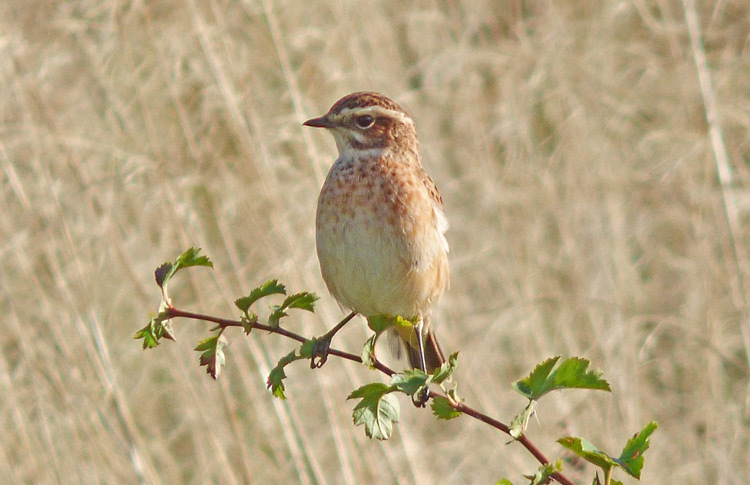 The breeding-distribution map for Whinchat in the 'Bird Atlas 2007 -11' (Balmer et al 2013) indicates confirmed breeding in SW Staffs in 2008 and N Worcs in 2011. However, enquiries with the West Midland Bird Club (WMBC) revealed that the club has no direct knowledge of these records and they do not appear in its relevant Annual Reports. 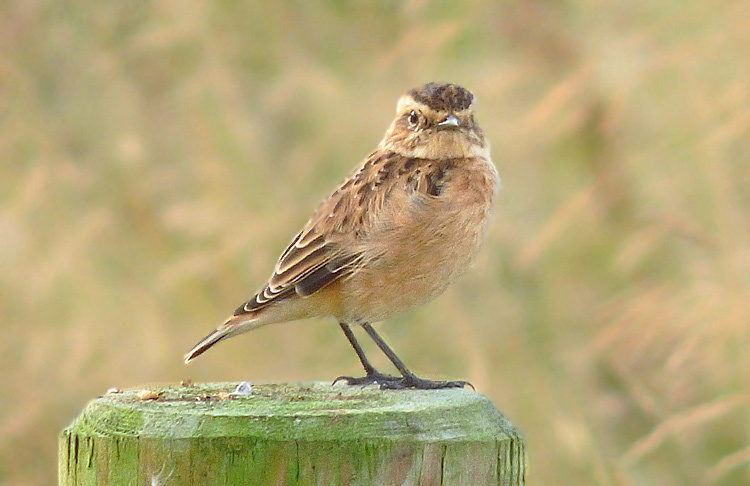 Contact with the BTO established that they were both based upon the category 'FL' i.e. 'recently fledged young', and as such were submitted in accordance with Atlas criteria. 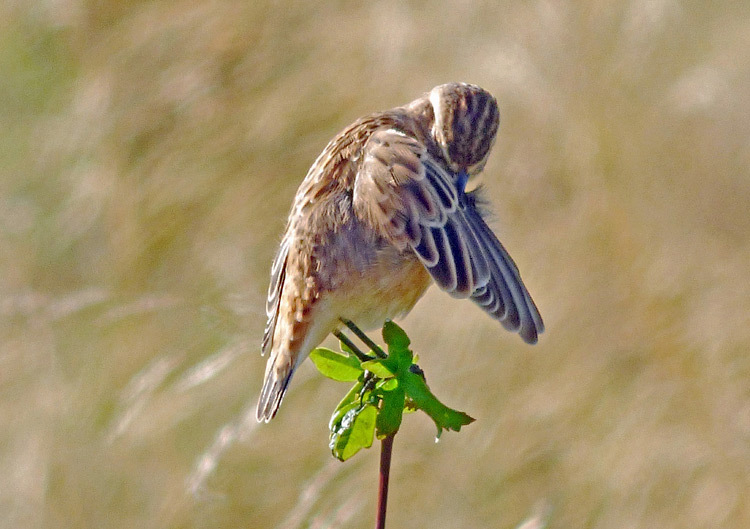 However, the category FL is regarded by many as more error-prone than other levels of evidence for 'confirmed breeding' (as apparently very young juveniles are sometimes capable of flying a considerable distance). 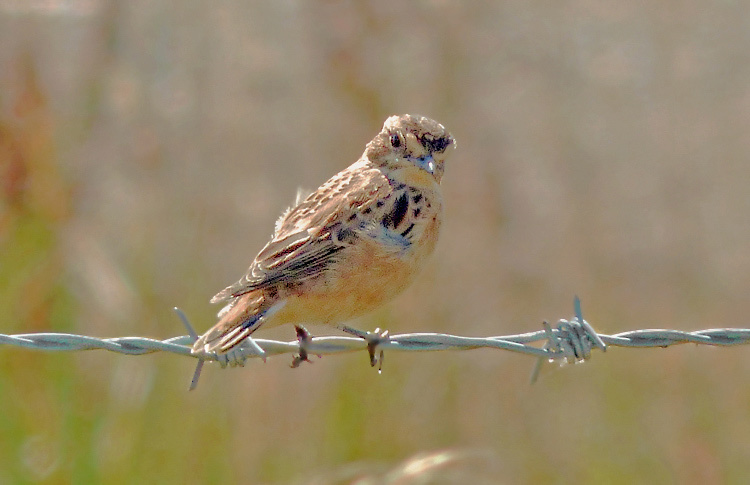 As these two reports involve areas where the species has not bred for a considerable number of years, the WMBC feels that they do not meet unequivocally its own requirements for fully 'confirmed breeding' in the localities concerned. 2. 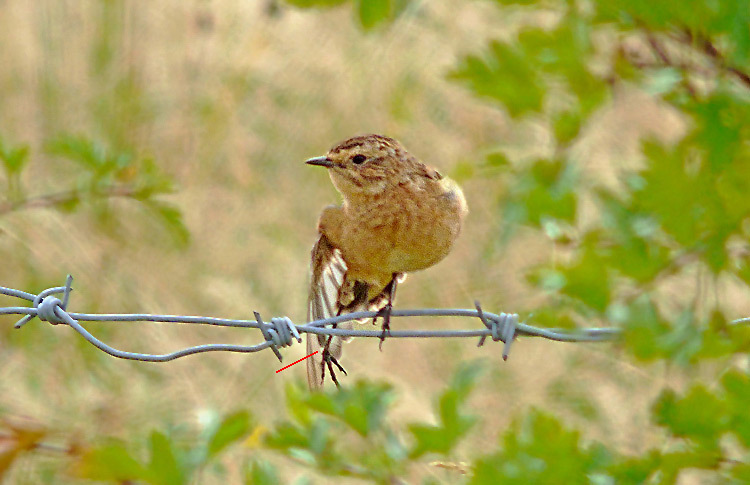 An exception to the norm of centrifugal moult of the rectrices is Spotted Flycatcher, which moults its tail-feathers centripetally (outermost inwards) and also moults its primaries ascendantly (see Lars Svensson 's IGEP 1992).